The image below provides in-depth information on how to measure your child and pick the right size. Please contact us at annatriantsales@gmail.com with any questions regarding measurements and sizing. - Compare your child's measurement to the size chart. 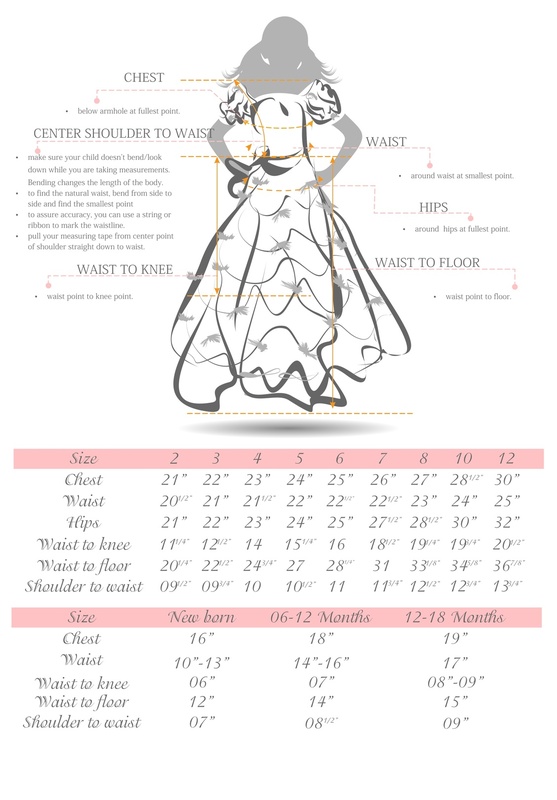 Ideally, you should select a dress size that is an inch or two larger than her measurements, as this will give her room in case of a sudden growth spurt before the event. A dress that is a bit big can always be altered to fit better, but options are limited for dresses that are too small. - If you choose to submit custom measurements, we will be adding about an inch to chest and waist circumference to allow room for some "ease". - Please keep in mind that some alterations may still be needed as our clothing is made from patterns designed to fit generalized children's proportions which may not be exactly the same for every child.